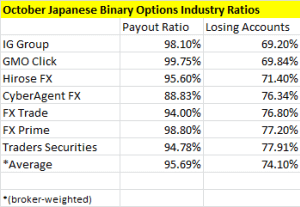 You may have heard, that binary options brokers based and regulated in Japan must publish anonymous statistics of all trading accounts. These statistics can be viewed further here: FinanceMagnates.com. I will summarize it below. On average, out of 100 binary options trading accounts, 26 profit, which is not a bad number. It means that every fourth trader is profitable. It’s not a big number, no, but it’s definitely a higher number than I would have guessed. So, you might believe now that binary options are not a scam and every 4th trader actualy makes money! And although it might be sad, most of the losing traders support us – traders who earn money. Without them this business would not be possible. All you need to do in order to be profitable is to learn, learn, learn. That is why I would like to remind you that on our site Binary Options, you can find lots of educational materials, such as free books or articles that I wrote myself from my own binary options trading experience. Perhaps the most important articles can be found here: Technical Analysis Series. Another thing that we can not ignore under any circumstances is the psychology of a trader and his money management. For example, I have written some articles about the money management of binary options. and in the future, I definitely intend to pay more attention to this topic and to write further articles, because it really is one of the most important factors.